It’s Saturday, May 16, and I’m petting an alligator that used to belong to a drug lord (OK, allegedly used to belong to a drug lord, but what’s the fun in that?). The 6-foot-long, 90-pound reptile is sitting on a table, being wrangled by Scott Ellis, one of the four volunteers who are presenting a Zoo to You exhibition at a backyard house party. WHO? WHO? : Zophia is an Eagle Owl whose eyes don’t move, though her head rotates 270 degrees. “Is it male or female?” I ask Scott. Scott, a firefighter by trade and now the fire chief at Diablo Canyon Nuclear Power Plant, has volunteered at Zoo to You for a decade, and the operation itself has had Spike for 18 years. With proper care, he could live to 30. This is the sort of insight you get from Zoo to You, not to mention hands-on interaction. When’s the last time you got to touch an alligator in a zoo? LATER, GATOR! 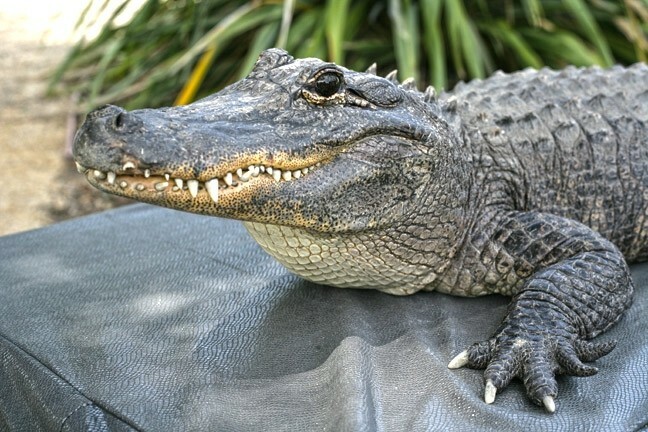 : Spike is a 6-foot-long, 90-pound American alligator that allegedly used to guard an illegal drug stash. Scott’s wife, Su Ellis, is standing nearby, introducing visitors to Roswell, a three-banded armadillo. She directs me to roll the tennis ball in his enclosure, and when I do, he scuttles after it and jumps on top, completely covering it. When I reach down to touch Roswell’s shell, he jumps up a little, startling me. “What does he eat?” I ask Su. I prefer the dry ones, and I get to pick,” she jokes. 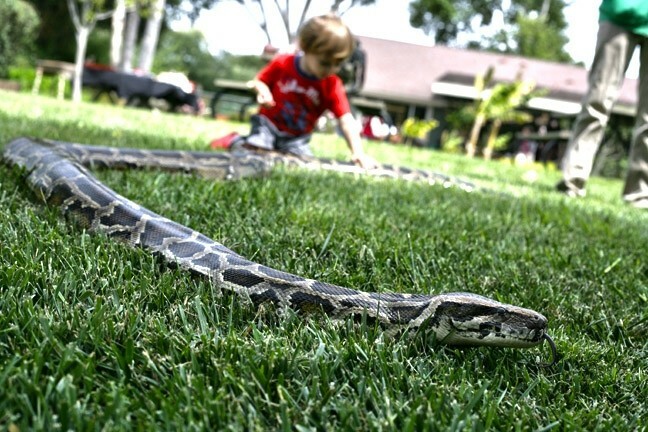 SNAKE IN THE GRASS: Julius Squeezer, a 100-pound Burmese python slithers around doing snake stuff. Su picks up Roswell and shows me his underside. It’s a view of an armadillo I’ve never had before and another reminder that Zoo to You’s hands-on experience is different from a traditional zoo. Next, I meet Pam McLean, who’s wearing a falconry glove with a huge owl on it. It’s also got a cord running from the owl’s impressive talons to the glove, which is good, because the owl, named Zophia, decides it wants to fly off, and Pam has to bring it back in. Zophia is fierce and beautiful looking, and as I run my hand down her feathers, I’m amazed at how soft she is. Pam, a volunteer for the last five years, got involved with Zoo to You to help lessen the stress of her job as an EMT with San Luis Ambulance. She was drawn to the hands-on experience, but I can’t help but ask, after watching Zophia fly off in a start, whether Pam’s ever worried about being attacked. 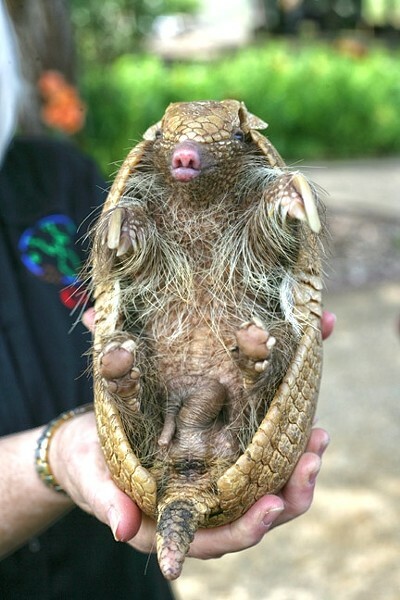 UNDER THE DILLO : Roswell, who got his name because he looks like a space alien, likes to fetch tennis balls. “The way we work with them, we hope not, but we always remember they’re wild animals,” she says. Diane Dieterich is walking Morocco, an African Crested Porcupine, and she’s explaining that despite thoughts to the contrary, porcupines cannot shoot their quills out. How do you know when it’s time to get out of the way? “He’ll rattle his quills and it will sound like a rattlesnake, and he’ll stomp his feet,” says the massage therapist by day and exotic animal wrangler in her spare time. ANIMAL DELIVERY! 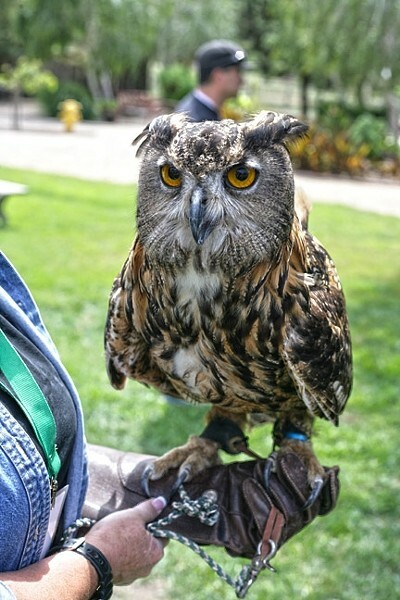 : Zoo to You of Paso Robles can spice up your event by bringing education and adventure together when they display live animals and offer entertaining storytelling with an enlightening message. Visit their website at the-zoo-paso-robles.com or call 391-0604 (or toll free at 888-ECOTUDE) for more information. For the record, I petted Morocco, but per Diane’s directions, only front to back. She also invited me to massage his “greasy, smelly ears,” but I declined. Just when I thought I’d seen all the animals I was going to see, Pam and Diane return from their Zoo to You truck with a fellow named Julius Squeezer, a 100-pount Burmese python, which they set on the grass. “I loved your work in Jungle Book,” I say, but he seems more interested in the little boy petting his tail. Snakes. So rude.